In 2017, smart buildings collected 14.6 zettabytes of data worldwide, and the amount of data is only expected to grow. Businesses across the world are using this data to make better business decisions, improve safety, become more sustainable and so much more. Wondering how a smart building with an IoT ecosystem can help your business? To understand how an IoT ecosystem plays an essential role in building automation and business success, we must start with smart buildings. What are smart buildings? They are automated buildings which use the Internet of Things (IoT) in some way. Oftentimes, buildings of all sizes will start with some of the simpler automation tasks, such as temperature control or smart light bulbs. These devices are connected to the network and can be controlled remotely or may be set on automatic schedules. But smart buildings can do so much more as well. If you’re curious what smart building can do for you, think of it like this - they optimize the human experience and can be adjusted to provide the best environment for occupants. In a data-driven world, smart devices provide you with the information to uncover inefficiencies and make mindful business decisions. We’re seeing smart building technology implemented across all types of industries from standard offices to healthcare facilities. Smart healthcare facilities quite literally save lives. Incorporating IoT into healthcare leads to real-time data which can be used to act faster during life-threatening events. In addition, smart healthcare facilities are more secure than your average hospital or nursing home. Security and access control systems help ensure equipment, records and patients are safe. Multi-tenant facilities can be difficult to manage, with so many unique spaces and people to take into account. IoT settings can be customized by room or person. With so many people sharing spaces, multi-tenant buildings can also have difficulty being energy efficient. Using occupancy sensors, IoT in apartment buildings can help reduce wasted energy by turning off lights and adjusting temperatures when rooms are unoccupied. Smart technology in schools and universities can actually make students more productive. The ability to change the environment means you can easily have a comfortable environment for gym class and test taking. On top of optimizing for productivity, IoT can help to keep students and staff safe. IoT can be used throughout industrial facilities to more easily track supplies, expedite shipping and limit errors. The result is a smart building that saves you money. While industrial companies have different security concerns than healthcare, the fact remains that all businesses have security top of mind. IoT can help you stop security risks, or detect them quicker. What is an IoT ecosystem? At its simplest, an IoT ecosystem requires a remote and smart device. The remote, usually a phone or tablet, sends commands to the device. In return the device sends information back to the remote. Many IoT ecosystems are much more robust - the “remote” controls dozens of systems which rely on multiple sensors and power everything from lights to security equipment and more. It is when businesses start to use these multifaceted IoT ecosystems that they realize the true value of smart buildings. To Igor, an IoT ecosystem means bringing together all sorts of best-of-breed devices as well as cutting-edge applications which allow buildings to become more flexible. Dwight Stewart, found of Igor, says before smart buildings, “people have always thought of buildings as a fixed environment,” but with the capabilities of an IoT ecosystem, buildings are now agile; smart buildings have the ability to change and grow with a business. How does Igor’s technology enable smart buildings? Igor has set itself apart from other IoT ecosystem technologies by offering an all-in-one hardware, software and analytics solution. Igor’s plug-and-play technology makes it easy for devices to be discovered and configured for your smart building. Igor’s node allows devices which are not yet IP enabled to be connected up to a Power over Ethernet (PoE) network. One node can handle multiple devices, allowing them to communicate together across a chain of devices. 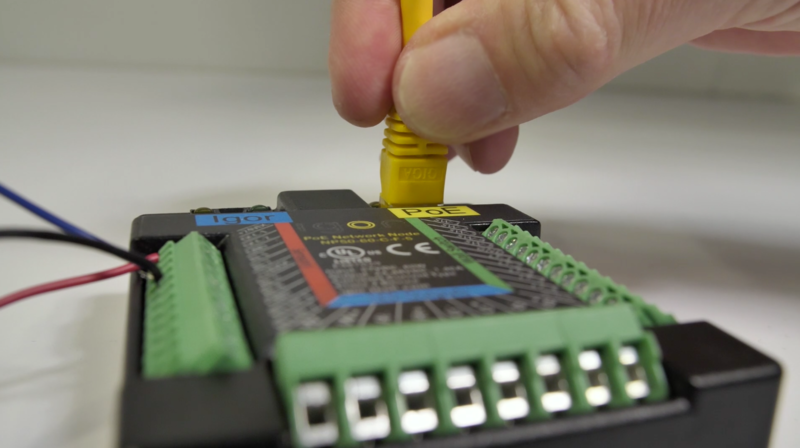 Igor’s node allows businesses to choose their own equipment - from relays to switches and even lights - multiple manufacturers are compatible with Igor. Simply choose your device from a list of profiled SKUs and the node will automatically configure for that device. 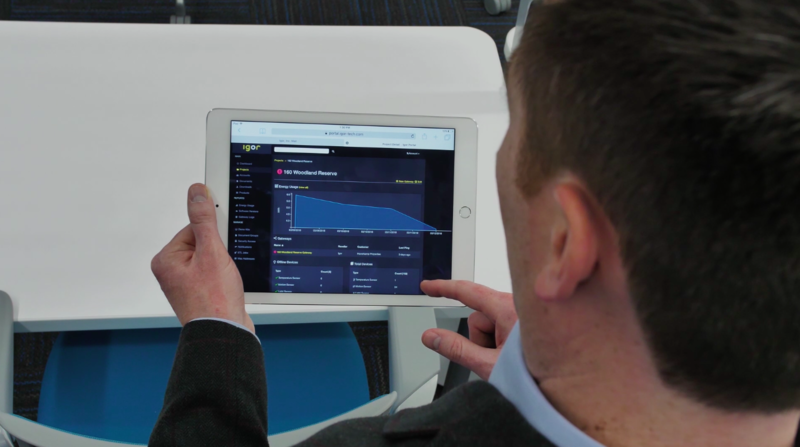 If you’re interested in learning more about smart buildings, request a demo with Igor today. Want to learn more about partnering with Igor? Fill out our partner request form.